After reading this post on Kamal's Blog, I was reminded of the code I have added to my own campaign regarding NPC responses to PC's actions. The following sentence by Kamal, in particular, reminded me very much of my own campaign: "No more trying to pick the lock with the merchant standing right there, at least not without potential consequences." 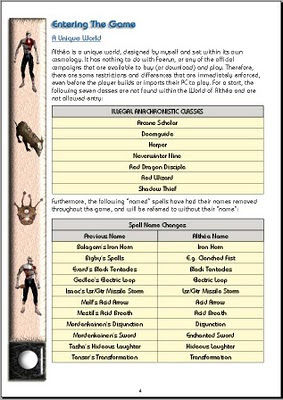 Kamal also mentions a few other systems, from pick-pocketing to mini-game lock-pickings, which all reminded me of additions I have included to my own campaign. Therefore, as I had not yet made a dedicated post about the Real Life System I have in my campaign, I felt it deserved one now. 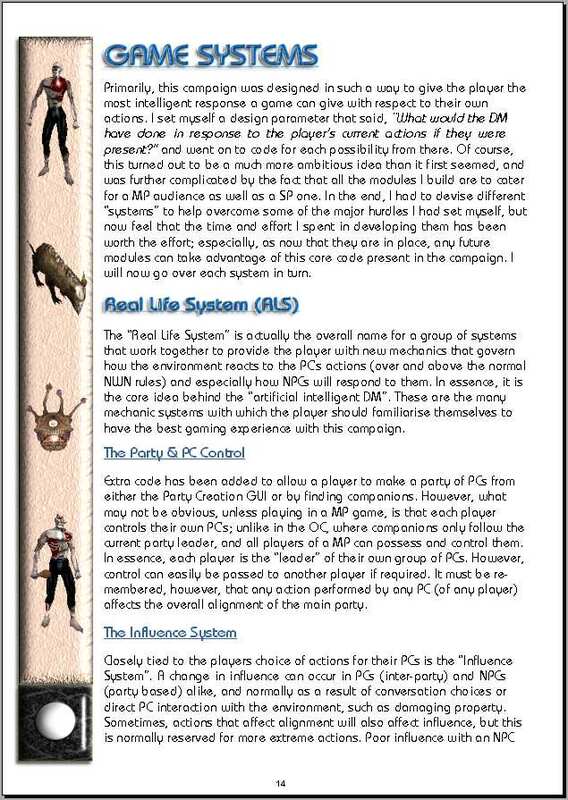 The “Real Life System” is actually the overall name for a group of systems that work together to provide the player with new mechanics that govern how the environment reacts to the PC’s actions (over and above the normal NWN rules) and especially how NPCs will respond to them. In essence, it is the core idea behind the “artificial intelligent DM”. These are the many mechanic systems with which the player should familiarise themselves to have the best gaming experience with this campaign. A) The party are able to prevent their actions being detected. B) Permission is gained from the object owner to interact with the object. C) The NPC preventing the action is “removed” from the vicinity. 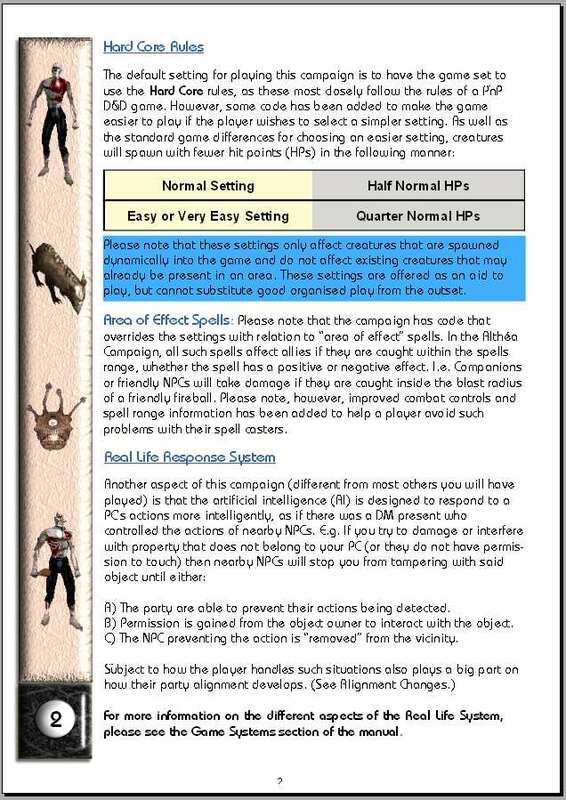 Subject to how the player handles such situations also plays a big part on how their party alignment develops. (See Alignment Changes.) 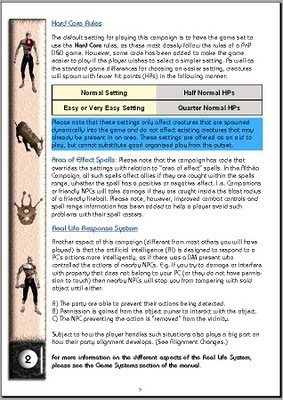 For more information on the different aspects of the Real Life System, please see the Game Systems section of the manual. Important to note, the Real Life System is fundamental to the design of the campaign and comprises many systems all with the same goal: to help the game respond to player's actions in an intelligent way as possible. 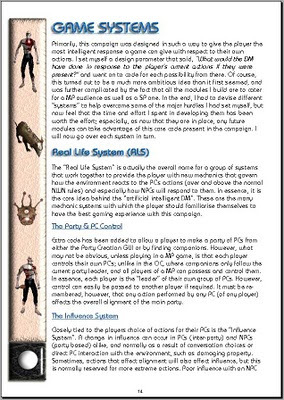 Key elements of the this governing system are the alignment and influence systems, which help determine the PCs interaction with other characters. There are, of course, many other considerations to take into account when creating a system like this, but I have tried to include them whenever possible; including such things as determining if a PC has taken steps to conceal specific actions, and preventing impossibilities such as invisible PCs from speaking to NPCs without choosing to become visible first. 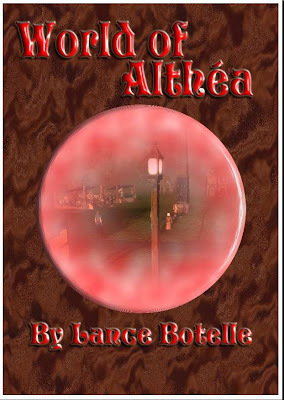 The end result is that the module feels much more responsive and alive to the player's actions. My only concern is that some players may find the result too challenging. FEEDBACK: If you have any comments regarding this aspect of the game (real life responses), then please give me feedback. Tell me of your own experiences and what you have liked or disliked in other games when it comes to this sort of thing. Is there something you would like included or excluded? As I mentioned above, I have been concentrating on putting the campaign manual together this week. It is not finished and will probably take me a few more weeks yet. The core design is in place, however, and I include a few of the finished pages (also reflecting some of the above post) as images below. As writing the manual took most of my time this week, I only managed a little work on the module itself, by preparing the 2da files for the load hints and load screens. I was caught off guard at first, when I discovered it was the nwn2_tips.2da rather than the loadhints.2da that required editing for the load hints, but after I realised this, all was simple enough. Both the 2da files have now been edited, updated and tested as working, but I currently have only one load screen image and a handful of tips edited in the tlk file. It should be a simple enough task to add to these at a later time. We enter the last few days for the latest poll: Will You Be Crafting? If you have not yet voted and wish to do so, then please vote before the time runs out. Very cool! The manual is pretty awesome. I was considering doing something like that myself, and seeing it in action makes me think that's the right decision. 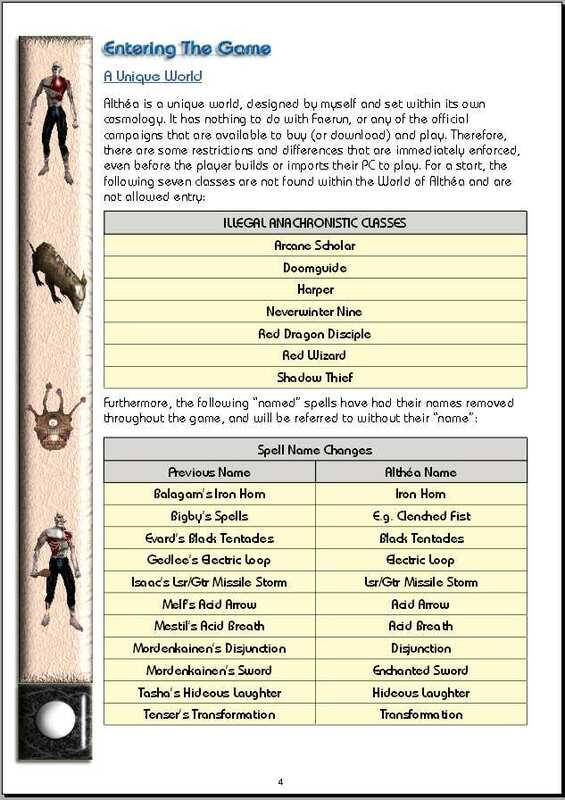 Have you considered just renaming the anachronistic classes? Two of those are very important to spellcasters who want to play with the big kids, and so I'm not sure how I feel about that. On the one hand, they don't fit your setting, but it might be putting a burden on possible character builds. An interesting update, as always Lance. Thanks again for your encouraging words and support. As for the classes, the problem is that they simply do not exist in my world and go against its established history. The magic/magik system is grounded in the world background, and so any class that alters the spell casting classes as much as these do, upset the story. That said, hopefully, there are enough changes and differences that can be acquired and played with the remaining spell casting classes (that fit the story) that will encourage such players to try them as an alternative. Managing new classes/feats, etc was always going to be one of the biggest problems for me because this campaign was born of AD&D, where mechanics and certain aspects of play were not as they are now. My world was built around these existing rules and had new rules added by me to accomodate my own ideas. This is the point when my world and others parted,casuing the differences you now see. From reading your blog it sounds as if you've been reinventing or working with the PRR system by Vendalus, and possibly UncleFB's npc control system. Did you alter those? The non-spellcaster classes might have Althea equivalent organizations? Shadow Thief is essentially some very large thieves guild, and NWN9 is essentially for a king's bodyguard or elite troop. Could classes be allowed, just with different class names? I was unaware of either of the two systems you mention, and so all the code for my system is my own work. I just found it interesting that someone else had done a similar thing and felt I ought to blog about my own system as it appeared to be of interest. The system has a number of functions that will come with the first module, which builders can look at for themselves. I hear what you say about potentially changing the names for the other classes (CW suggested the same), but it would also require me to build the equivilent organisations behind these classes. For instance, there is no "king" in my campaign and there are currently no very large thieves guilds ... smaller guilds and gangs, yes, but large and very well organised to this degree, no. Maybe it is something that I can look at after the 3 modules have been released, and if I can find good reason to include them. ;) My gut feeling, however, is that they do not fit well.